Pixar have done it again. Their latest offering, Up, the tale of a lonely old man who decides to pursue his childhood dreams and fly his home to South America, is a visually and emotionally satisfying treat for all ages that will leave you with a smile on your face long afterwards. Up opens with a black-and-white “documentary” about infamous adventurer Charlez Muntz who travels all over the world in his airship The Spirit of Adventure. Just like us, a little boy, Carl Frederickson, watches rapt in the cinema audience, refusing to lose faith when Muntz is accused of faking the discovery of a mythical bird and stripped of all his honors. He wanders the streets of his neighborhood, searching for his own adventure, and finds it in the form of toothy chatterbox Ellie who also idolizes Muntz. After bombarding the quiet boy with her plans and dreams, she announces, “You don’t talk much! I like you!” She makes him promise that one day he’ll somehow fly them to Paradise Falls in South America, following in the footsteps of their shared hero. The ensuing wordless montage of Carl and Ellie’s life together succinctly conveys how their loving marriage is marred by two profound disappointments; never being able to have children nor the adventure of their dreams. By the time we catch up to the present day, where a now alone and bitter Carl (voice by Ed Asner) is stubbornly trying to protect his home from contractors, we know him well. Despite his typical grumpy old man demeanor, we empathise with his deeply buried regrets and broken heart. 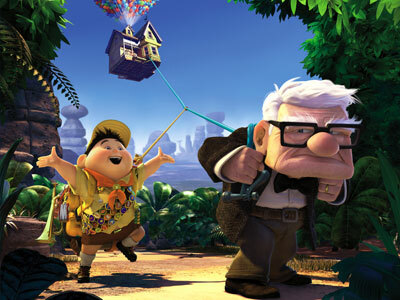 Luckily there’s not much time to dwell on sadness, because Up quickly kicks into high gear, as Carl defiantly propels his home into the air with the aid of a veritable rainbow of balloons, and with Boy-Scoutesque “Wilderness Explorer” Russell (Jordan Nagai) as an accidental hitchhiker. The unlikely adventurers are soon facing various trials and tribulations, from lightning storms to talking dogs, in Carl’s quest to move his home to the top of Paradise Falls, and Russell’s mission to earn his final Wilderness Explorer badge by assisting Carl. Pixar breaks new visual ground with every film – i.e. the lush underwater environment in Finding Nemo – this time it’s the weather and aging effects. Unlike in other special effects-laden films that seem to be simply showing off (yes Star Wars 1-3 and Matrix Reloaded/Revolutions, I mean you), these aesthetic touches enhance the story. When Carl and Russell get caught in a vicious storm, the thunder and lightning serve to crank up the suspense, instilling vertigo in every viewer. The crinkles on Carl’s face and the creaking of his joints amplify his expressions and add comedy, especially when he engages in a walking-stick attack against a similarly arthritic nemesis. Even more impressive than the visuals, is way Up deftly tackles a difficult topic: losing a loved one. Up is not afraid to make you cry, but rather than lapsing into emotional manipulation, it strikes the right balance, threading its dramatic heart with plenty of action and humor. This successfully comes together particularly due to the spot-on characterisation of Carl and Russell and their developing relationship. It’s refreshing for an animated film to focus on an elderly character, and crotchety Carl is the perfect blend of comic and tragic. Despite his sky-high fantasy, he is down-to-earth, and viewers young and old will be able to relate to him. Russell starts off as the usual, annoying “Are-we-there-yet?” little-brother type, but soon evolves into the hero of the piece, unwittingly leading Carl into the very quest his inner child wanted, by virtue of his good heart and Wilderness Explorer values. The villainous Charles Muntz (Christopher Plummer) is the only other main human character, with the rest of the cast nicely rounded out with a bunch of quirky, expressive creatures, including Kevin, a colourful Dodo-like “Snipe” who forms a reciprocated attachment to Russell and Dug (Bob Peterson), a dopey, would-be-kidnapper canine who talks with the aid of a hi-tech collar and decides to devote himself to an unwilling Carl. Plus, despite the fact that there are a number of cinematic luminaries offering their vocal talents these do not at all distract from the characterisation. Far too many animated films these days rely on stunt vocal casting (see Angelina Jolie cameo-voicing a fish in A Shark’s Tale and a tiger in Kung Fu Panda) that seems to serve little purpose other than to boost ticket sales. The only problem with Up is that most of the emotional punch is packed into the introduction and that after a novel first half, it unfolded rather predictably. However, even when it becomes clear where it’s going. you’ll still enjoy the ride. And make sure you’re not late to a showing, as it is preceded by a truly delightful short, Partly Cloudy, which well complements the main feature. Up is among Pixar’s very best, ranking up there with Wall-E, Finding Nemo and Toy Story.